Acropolis with theatre and Trajan Temple. 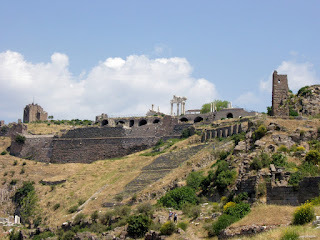 Pergamum (Pergamos, Pergamon) is a large site so you may need to narrow your survey a bit. I’ve spent several days there and still did not see everything. Pergamum (modern Bergama) is celebrated as “the most famous place of Asia” (Pliny Natural History 5.126 [Rackham]). 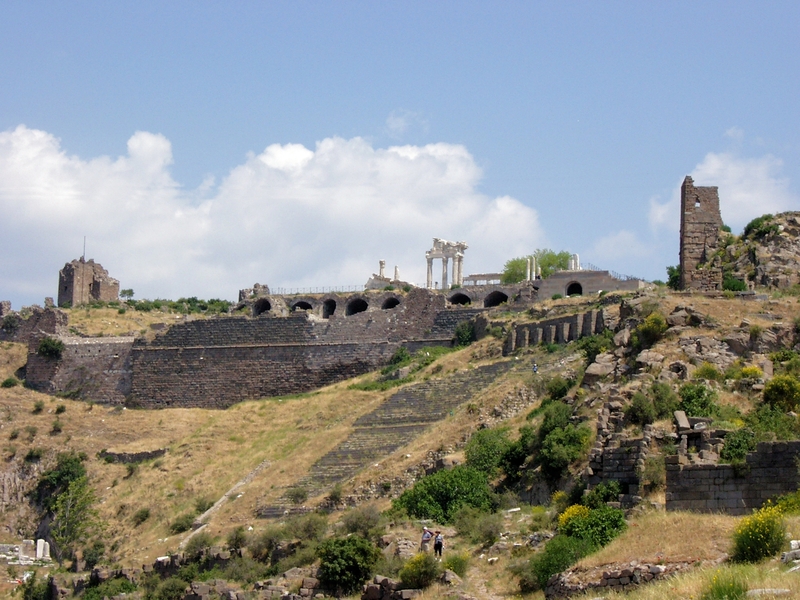 You will want to focus on the many temples and the upper (acropolis) and lower site of Pergamum. Also, make sure to examine what is mentioned in Revelation about "Satan’s Throne . . . where Satan lives” (Rev 2:13). Most of the site has been excavated and depending on the year there may or may not be anything being done on the site. Remember to provide"the historical background of the site (including history of previous archaeological excavations, if any), objectives of the current excavation, progress at the site, and significance of discoveries to biblical study.” Make sure to choose a good encyclopedia, journal articles, and books that specialize in the subject. This will give you a cross section of material. Ramsay, William M. The Letters to Seven Churches. London: Hodder & Stoughton, 1904. LINK There is an newer edition with few differences but not online. Ramsay, William M. The Letters to Seven Churches: Updated Edition. Edited by Mark W. Wilson. Peabody, Mass. : Hendrickson, 1994. Graves, David E. “The Influence of Ancient Near Eastern Vassal Treaties on the Seven Prophetic Messages in Revelation with Special Reference to the Message to Smyrna.” Ph.D., University of Aberdeen, 2008. Hemer, Colin J. The Letters to the Seven Churches of Asia in Their Local Setting. The Biblical Resource Series. Grand Rapids, Mich.: Eerdmans, 2001. Blaiklock, E. M. “Pergamum.” in The Zondervan Pictorial Encyclopedia of the Bible, Vol. 4, ed. Merrill C. Tenney. Grand Rapids: Zondervan Publishing House, 2009. Myers, Allen C. ed. “Pergamum.” The Eerdmans Bible Dictionary. Grand Rapids, Mich.: Eerdmans, 1996. Burge, Gary M. “Pergamum,” Freedman, David Noel, Allen C. Myers, and Astrid B. Beck, eds. Eerdmans Dictionary of the Bible. Grand Rapids, Mich.: Eerdmans, 2000. Pfeiffer, Charles F., ed. “Pergamum.” pages 438–440 in Wycliffe Dictionary of Biblical Archaeology. Peabody, Mass. : Hendrickson, 2000. Ussishkin, David. “Pergamum (Place).” Edited by David Noel Freedman, Gary A. Herion, David F. Graf, and John David Pleins. Pages 666–679 in Vol. 4: The Anchor Yale Bible Dictionary. 6 vols. New York, N.Y.: Doubleday, 1992. Ramsay, William M. “Pergamum.” Edited by James Hastings, Frederick C. Grant, and Harold. H. Rowley. Dictionary of the Bible. New York, N.Y.: Scribner’s Sons, 1963. Modified April 13, 2016. Copyright © 2016 Electronic Christian Media.